If the Europeans can tunnel under the English Channel, the Tehachapis are clearly within our means. Photo: Wikimedia Commons. The California High-Speed Rail Authority says it will shift gears by building the first operational section of the bullet train from the Central Valley to San Jose rather than going to Burbank first, as initially planned. Trains would share the Caltrain tracks from San Jose to downtown San Francisco. Nonsense. Anybody can Google the project maps and see that the plan is still exactly what the voters approved. And they approved it because they realized as the state grows and pollution and environmental problems get worse, it’s idiotic to just keep widening roads, since we know that doesn’t work. A fast train between the northern and southern parts of the state is the solution, as anyone who travels overseas already knows. Yes, the costs have varied. There’s simply no way to build a 400-mile system across the diverse terrain of California without adjusting to the discovered realities on the ground; not to mention the ever changing politics and finances, which changes the construction timeline and with it, the costs. It is not credible that the voters of California didn’t grasp that when they approved the project–especially since the Proposition stated that the legislature would have to look at the finances and give final approval. That happened in 2012, after a vigorous debate in legislative committee and on the floor of the Assembly and State Senate. There are other bits of misinformation that opponents throw out, ad nauseam. For example, despite what the critics say, there’s a very good reason to route HSR to the Bay Area from Los Angeles via the Central Valley and Palmdale, rather than straight up the Grapevine and the I-5 alignment–there’s a second project, called Express West that will connect the system at Palmdale to Las Vegas. Obviously, a 15 minute addition to the travel time from LA to SF is worth it if it also connects the entire system to Las Vegas. Even someone who thinks Bakerfield, Fresno and the other cities of the Central Valley aren’t worth a diversion, can’t seriously support an alignment that orphans the Las Vegas train. In other words, the alignment is both what the voters approved and a sound route. Now, bridging the Tehachapis is indeed challenging–the hardest part of the whole project. But spurious reporting from the LA Times has Californians believing it’s insurmountable. That’s absurd; if laborers could build tracks through the Tehachipies in 1876, obviously it can be done again, and to HSR specifications. Considering the challenges of building HSR tunnels through the Hakkōda volcanic mountains in Japan, the Sierra de Guadarrama’s in Spain, other mountain ranges in Japan and China, not to mention the English Channel, pretending the Tehachapis are an unprecedented obstacle to an HSR project is just silly. But the same interests that fought HSR in Florida, Texas, the Midwest and past projects in California, are never going to stop sowing misinformation to reporters and politicians. It wouldn’t matter if HSR was proposed from LA to San Diego again, or along I-5, or anywhere else–there’s a well-monied, well-oiled machine out there that will fight any project that reduces our dependence on cars and petroleum. It’s no coincidence that we’re seeing yet another potential ballot initiative—one of their favorite anti-rail weapons—to kill HSR by diverting the funds to water projects. Water infrastructure has to come from HSR money? If we’re going to divert money from transportation to water, okay–stop widening roads right now. Speaking of which, why aren’t the same “fiscally conservative” HSR opponents complaining about widening, a true fiscal travesty? Lets also remember that the bond set up funding for a host of connecting rail projects, including upgrades to Muni and Caltrain. The proposal, if it ends up on the November Ballot and passes, will take down vital transit projects all over the state. That said, even Bay Area residents should be disappointed that the CaHSR Authority is forced to turn away from bridging the gap through the Tehachapis in the next phase of the project. Anyone who takes Amtrak from LA to the Bay Area understands why–right now, there’s a bus bridge from LA to Bakersfield because it’s not practical for Amtrak to use the old rail route through the mountains, which is slow, circuitous and saturated with freight trains. If the CaHSR Authority bridged the Tehachapis first, it would be possible to run a bullet train from LA to Bakersfield and up through a significant portion of the Central Valley at over 200 mph. Then the train could continue to Oakland on Amtrak’s existing “San Joaquin” tracks, towed by a diesel locomotive, as in this demonstration run from the 1990s. It’s not a very elegant solution, but it would give Californians a one-seat ride from LA to the Bay Area sooner. And prioritizing getting rid of the bus bridge from LA to Bakersfield was favored by most rail advocates. Still, it’s disingenuous for the politicians who have done everything possible to prevent that to now criticize the Authority for changing priorities. All of that aside, modernizing the rail system from San Jose through the Central Valley first will have tremendous value in its own right. The fast connections will open new housing opportunities and reduce pollution from cars. The section has to be built anyway if there’s ever going to be a bullet train all the way from LA to San Francisco, so why not do it now? There was a time when building transportation was something both parties agreed on and High-Speed Rail was once (and sometimes still is) supported by many prominent Republicans, including former Governor Arnold Schwarzenegger, who remains one of its biggest boosters. It’s time for our leaders, even those who don’t like HSR, to act like grownups and stop re-fighting a battle that was settled in 2008. So if Patterson and some of the other anti-rail lawmakers really don’t think it’s a good idea to go to the Bay Area first, they should stop their complaining and their parochial obstructionism, do their jobs as state lawmakers, and work to find a way to get the project over the mountains. Rather than destroy the project, why not work to improve it? If SF to LA is not a good candidate for high speed rail in the US, I’m not sure what is. Work to make it better, not to destroy it. Did the voters get to vote on this level of detail for the highway system? If not, why the massive difference in expectations between the two transit systems? If every damn little detail of such an enormous project (which requires way more expertise and research than the average citizen with a day job is capable of) must be put up to a vote, we will never get anything accomplished. These propositions need to go away and lawmakers need to learn to do their job without falling back on the masses with day jobs to try and do their job for them. I’m much more optimistic about this project now that this plan is out. When the cost went up to $100 billion, due to over-engineering, I thought it was not worth the cost. But the new plan is cost-effective. Compared to the last, $68 billion phase 1, this new plan saves more than $4 billion: it actually saved $5.5 billion (an 8% decrease), despite increasing the estimated costs for the difficult southern mountain crossings. They then added $2 billion to get to Anaheim in the 1st phase, which brings us to $64B. Compare this to the projected profits: $1 to 2 billion a year after the phase 1 system is complete. It’s not a big enough profit to pay for a bank loan for the whole thing. But private partners only have to pay for part of the southern section, it makes business sense: $1 to 2 billion a year on a $20 billion investment. Even the SF to Bakersfield segment has over an 85% probability of turning a profit, probably in the low $100 million’s per year. It might be slightly less expensive to build such a system, but the big cost of tunnels from Bakersfield to Burbank is needed whether at 150 mph or 220 mph. And getting the time down from 4 hours to 3 hours really increases the ridership and revenue: 3 hours is faster than taxi+flying for most destinations (especially downtown/central LA to San Francisco). 4 hours is similar to flying, door-to-door. If the Feds were offering to pay 80%, like they did for the Interstate system, or if the state wanted to fund more than 50% of the cost then a slower train could work. But with the business plan requiring $10+ billion in private financing, the system needs to turn a $1 Billion a year profit. That’s where you need high speed. The Amtrak bus from Bakersfield to LA only takes 2:20, so SF to Bakersfield by HSR + bus to LA will be about 2:00 + 2:20 + 10 minutes to transfer = 4.5 hours; 1 hour faster than driving SF to LA without traffic. CAHSR will take 1:45 from LA to Merced (express), so if a Southern IOS were built all the way to Burbank and LA, it would still take over 5 hours to get from LA to SF by train; 45 minutes slower than the Northern IOS + bus. We’re talking about SF to SJ, which is the entire route, and not cherry-picking the longest non-stop segment. And SF to SJ is about an hour on the fastest “bullet” trains. The top speed is OK but it’s all the stops, with deceleration and acceleration, that are the problem. It’s a commuter train and not an inter-city express. A true HSR would stop nowhere between the two cities, and take less than 30 minutes. Or maybe one stop near the airport. OK, well I hope it works better than the current system of allowing the “bullet” trains to pass the stopping trains. Because I have sat stationery for ten minutes or so a number of times waiting for a delayed “bullet” trains to trundle past. Personally I think HSR should be aligned with the Amtrak tracks in the east bay with a tunnel under the Bay into Transbay. But of course we can’t do that because of CEQA. Yes, it is so clear I am just freaking out. That must be it. You’ve cherry picked my comment, but let’s take your comment in it’s entirety – so you feel that environmental and social justice concerns aren’t valid? Fascinating. The 12 trains per hour, dedicated tracks and platforms, viaducts, etc are there along with the speed requirement to fulfill the vision of those like Kopp and Diridon that CHSR will be a very high speed system, which is not what I think people in most communities have assumed. As to whether it meets the travel time requirement, this is the reason why there’s a lawsuit. The litigants don’t believe that requirement will be met and therefore the project should be killed. The outcomes could be a decision that the project should be killed, that CHSRA must put back project elements, however controversial they are, to meet that speed requirement or otherwise be killed, or that variation of travel time can be accepted because of the complexity of the project and the failure by the litigants to demonstrate harm if the travel time is 3 to 5 minutes longer than Prop 1A demanded. The problem is the requirement for high speed infrastructure in urban areas, which is driving all the grief and the cost. It is simply not the case that the blended system on the peninsula can support 12 HSR trains per hour in addition to 6 Caltrains per hour. There are no viaducts planned on the peninsula, and CAHSR have stated that it is their intention to share platforms with Caltrain rather than building their own. All this information comes from the cost estimates section of the 2016 Business Plan. I’m aware that there is a lawsuit over the 2:40 travel time, but I don’t believe it will be successful. I agree that it was a bad idea to put the travel time requirement in prop 1A, but it’s not responsible for the issues with the project. Because of the speed requirements, CHSRA has narrowed down the train selection to single level high platform trains. So should Caltrain also raise platforms everywhere to allow unrestricted platform sharing? And who is going to pay for it? If HSRA is saying that it can help pay for it but has no funding timetable, are Caltrain and communities expect to hold back their plans because of platform uncertainties? Honestly do we need unrestricted platform sharing, versus building dedicated platforms for those that will be served by HSR? We don’t know and HSRA isn’t telling us. Firstly, the reason HSR no longer has 12tph capacity on the corridor is because there are no longer four tracks planned for the entire length of the corridor. It’s not about sharing platforms. So there’s your answer. HSR will pay for upgrades at the stations that it uses, and Caltrain will need to fund the rest itself. That means Caltrain will have to pay to rebuild all of their platforms if they want level boarding at every station, but that would have been the case regardless of whether Caltrain/HSR went with 48″ train floors or 25″ train floors. They also don’t have to raise the platforms if they don’t want to. That might not be the answer you want to hear, but it’s ridiculous to say ‘HSRA isn’t telling us’ when it’s written into their business plan, and will shortly be written into the environmental documents for San Francisco – San Jose. Americans had YUGE problems with the Interstate, but little power to stop it. The price tag was inflated by accouting shenanigans. It’s still around the $33 billion ballot price in “year of ballot” dollars; they were required by a stupid law to redefine the numbers in “year of expenditure” dollars (i.e. add a projected-inflation adjustment to them). The projected-inflation estimates are grossly too high, so everything’s going to come in under budget from here on. TRAC has been taken over by one fanatic, Richard Tolmach, who has an irrational hatred for CAHSR. The other group is actually a NIMBY group and opposes all rail service while supporting highways, although they lie about it. Their record is clear. For CAHSR to spend $0.02 to connect to Las Vegas is a waste of money. Remember: Las Vegas Monorail went bankrupt. It went bankrupt because the bus and taxi drivers used their political influence to require that it NOT connect to the airport. The same political-influence-designing is going with CAHSR — to get Sierra Club support, Prop 1A has a provision that FORBIDS a station in Los Banos. In the old days, politicians wanted transportation connections in their cities. Now, it is proof of political muscle to force transportation away from places common sense would connect to. This is exactly the reason to do the Palmdale-Sunland tunnels: it shortens the portion of the line in “urban areas”. It also removes thousands of degrees of curvature. It anything can get the Palmdale route back on a true “high speed” track, the tunnels are it. Platform raising is a WHOLE lot cheaper than building a raised viaduct for the entire distance between South San and San Jose. Tunneling under the San Gabriel’s is potentially a huge improvement and will actually cut costs. There will be about four miles of tunnels on the existing proposed route, a couple of miles of elevated structure and thousands of degrees of curvature as the proposed alignment winds around SR 14. All that will be eliminated by “taking the shortcut” under the San Gabriel mountains. This is the “base tunnel” for which the system has been waiting. It’s considerably shorter — and safer — than a base tunnel under Tejon. 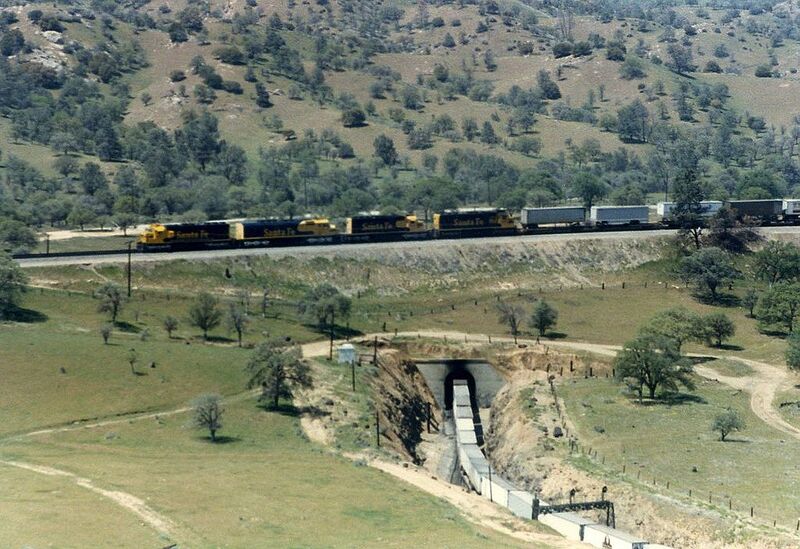 The dangers of tunneling through the San Andreas Fault killed the base tunnel idea originally, necessitating the long S-shaped alignment that landowners hated over Tejon. Conversely, the north portals of San Gabriel tunnels would be a few miles south of the fault. You seriously don’t think that signal mast can be moved? WOW! You’re a troll. Well then, the speed is 40/45 * 60, isn’t it? Or actually 53.3 mph. That’s a wee bit faster than 40. 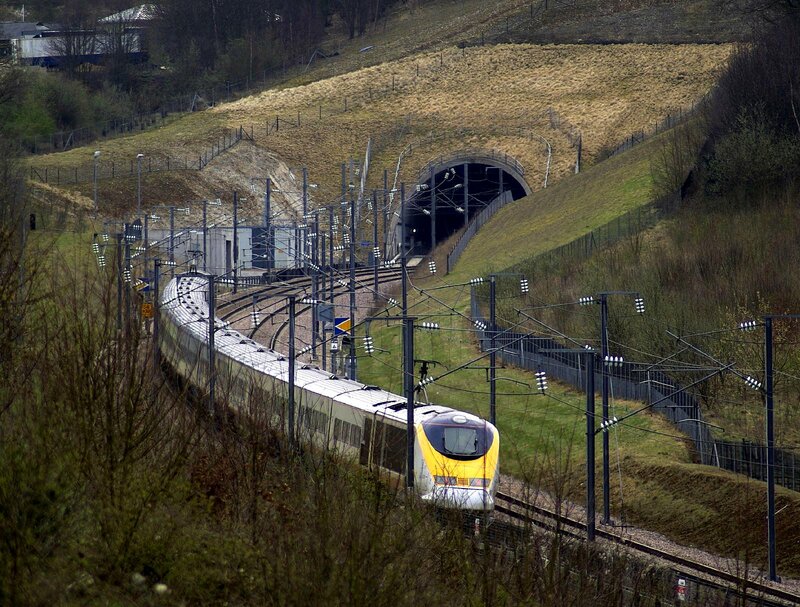 Do you work for a tunneling firm? Nope. There are no roads to the middle of the Gotthard Base Tunnel, either, and the mountains over it peak about 3000 meters higher than track level. For an escape route one simply builds cross-tunnels with bulkheads in them. If they’re choosing an alignment which destroys so many homes, they’re being foolish, probably so they can maintain a higher speed. The utility right of way and the Tujunga Wash provide an almost completely unimpeded access to the base of the mountains. There’s no need for an intermediate tunnel between the UP ROW and the Wash. They don’t even need to cross the Sunland-Tujunga City Limits. I appreciate all those citations to scientific data you posted to debate the article’s citations. Certainly sways my opinion. We voters weighed in years ago. GET OVER IT. WE WANT HSR. WE’RE PAYING FOR IT. It doesn’t help when the cost is driven up billions of dollars by eternal lawsuits by central valley inherited wealth that don’t actually serve anyone but the lawyers. You’re not paying for it. That’s where you’re mistaken. It’s SO not paid for. And what we voters weighed in on is NOT what is now being proposed. Sorry things are more complex, but glad some of us are closely involved. If the HSR was properly vetted, there wouldn’t be the lawsuits. We would all be mindlessly clapping for Jerry Browns pipe-dreams and singing Kum-bah-yah. Comical. Expecting unavailable scientific data about future events be provided in order to sway your “opinion”. Opinion…? Perhaps Kool-Aid addiction is more accurate. Those landowners would still be filing lawsuits, because the only thing they hate more than taxes is progress, since that might eat into some of their wealth and family legacy. They would be filing lawsuits against I-5 if that was being built today. OK, buddy, sure. Name calling and hurt feelings wins arguments between first-graders, so go out and play, leave the discussion to the adults. Eat into their wealth? Wrong, as they are coughing up millions of dollars on matters of principle. Cortopassi should be thanked. I’ve been trying to find the exact measure text that forbids Los Banos – any idea? I’ve found lots of summaries. Was it a separate lawsuit? At the end of the day, the only thing that matters is how much it will cost for someone to travel by High Speed train instead of airplane or car. Unless there is serious government subsidy for operations, why would anyone pay double the price of a plane ticket to arrive much later? There has to be thinking about after construction realities before just dumping money into this. Build the sections that can be made financially sound first. Real high speed lines between SF and San Jose even to Gilroy. Where populations are already concentrated you can argue their will be greater ridership. And when people start comparing California to Europe or Japan, don’t forget the population densities are very different. Even in small towns like Dijon, France many people do not own cars because the city is walkable. So a trip to Paris is a train ride. California developed with the car in mind. Unless we are going to redevelop cities into concentrated cores, it is unlikely that rail will ever make much business sense. I know I refuse to take Amtrak from SD to LA because the cost is astronomical compared to a car ride. And then there is the terrible station locations and lack of light rail connections to places I need to go once I am there. So why train it to LA only to rent a car? Rail has to grow locally so that connecting to a high speed line makes sense. Why don’t we simply upgrade the existing railroad that goes through there, then? Let me guess…it’s like we said a lot in the Navy: that would make too much sense. lol. Really the HSR should be an elevated monorail built down the median of I-5. It’s mostly flat and already owned by the state. We could go down the median of 101 briefly to connect it to San Jose and Oakland before going back to I-5, or simply build connections along the existing highways that connect I-5 to those two cities. Again, that would make too much sense. I’m a moderate liberal, but I voted no on the HSR. HSR is a substitute for flying, not driving. As far as I can tell, there are plenty of people who fly between SF and LA. How do they get around when they land, I wonder. They rent a car or call Uber. Incidentally, the route between Tokyo and Osaka takes 155 minutes, is 340 mi. long and travels at a top speed of 285km/h. The fewest number of stops is five (including terminus). That route has taken 85% of air travel. There’s a ton of regulation regarding the interstate system, The Interstate was meant to serve a ton of secondary military purposes (such as serving as potential land fortifications and emergency landing areas for aircraft) in addition to its economic role as a freeway. I’m fairly certain they won’t be able to build in anyway that could interfere with one of these roles. Second of all the I-5 avoids the downtown area’s of several important Central Valley cities such as Fresno and Bakersfield. Many travelers who will ride the train won’t have their vehicles, and will want to be as close to the major economic areas of their destinations, as possible. Finally, the corridor they’re building along already has been flattened and utilized for existing cargo rail, they’re literally taking this time to lay the rail and build a handful of bridges and stations (since Bakersfield and Fresno won’t allow improvements to be made to existing stations), which they’d have to do even if the built along/on/near the I-5. The scientific data is not unavailable, Civil Engineers constantly do infrastructure studies (For ex. http://www.infrastructurereportcard.org/california/california-infrastructure/). Same thing libs say about OTax. Not that dumb to bite. This question might fall on deaf ears, but why didn’t the City of Los Banos get a rail stop in this project? Can anyone explain that? The Sierra Club and other like-minded people (preferring infill and density and transit in the Bay Area) fought it to prevent high-speed-rail-assisted sprawl.